I’ve seen it first-hand. Despite companies aspirations to openess and full cooperation, there exists a rivalry over “control” of social media with the main combatants Communications/Public Relations (“PR“) and Marketing/Advertising (“Mktg”), leading to internal battles, mistrust and inefficient social media use by both. And each discipline has valid reasons for wanting this. 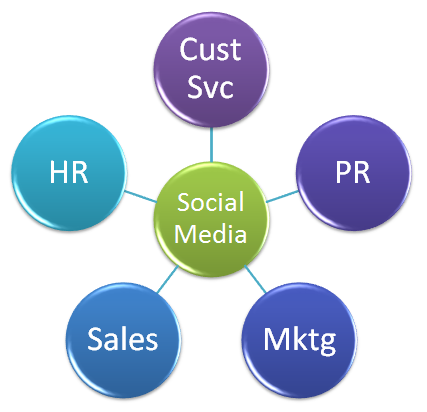 For PR, social media is a communications, corporate reputation and thought leadership opportunity which will lead to increased, unpaid brand mentions — “earned media”. Mktg views it as an additional opportunity to advance its message to potential and current customers to advance its sales goals. Both have valid points. And the truth is, that utilizing social media by one area without the other is a losing proposition. Organizations that relegate social media to marketing only are losing the vital advantage that social listening; conversational engagement; brand enhancement and thought leadership brings when marshalled by PR. Also, improper use/overuse of social media for purely marketing/advertising purposes can have the opposite effect of turning off your audience to your social media efforts entirely. Similarly, social media use by PR only is a lost opportunity to connect with the audience to convey the value proposition of its goods and services. And so, in most companies that have realized the advantages of leveraging social media there exists either dual strategies or, worse, no strategy at all as both areas do their own thing. This leads to fierce competition for resources and recognition, departmental distrust, and breakdown in communication (ironic, given social media’s utility for increasing communication). So Where Should Social Media “Live”? Of course, in a discipline as young as social media (very few of us have been paid social media practitioners for over 10 years) PR and Mktg are not the only areas where leadership social media mat reside. For my 10 years working at AOL it was in the Product division; during my tenure at BusinessWeek it was part of the Digital division; and when I worked at Bloomberg L.P it lived in Communications, but then later consolidated (to my chagrin) into Marketing. While not the ultimate answer (see below), if forced to make a choice mine would be PR. The upside potential for understanding audience sentiment; deepening end-user engagement; developing brand supporters, loyalists and defenders; and raising awareness of the organization’s goods, services and leaders is best handled by communications pros. The one caveat: the need for a social media professional, one who has a visible social media footprint, a and documented success as a paid professional on staff to lead the organization in developing an overall social media strategy; implement best practices; develop internal social media policy; evangelizing social media internally including education and training and working with other departments such as HR and, yes, Marketing to employ social media the right way is an absolute requirement. That is not the final answer to the “who owns social media” question — it’s the way most companies should proceed at the early stages of this discipline. The ultimate answer is: the opposites: “No one” and “Everyone“. A fully integrated, successful social media strategy’s goal should be where both no department feels that they own social media; but every department is responsible for utilizing it as part of a comprehensive, coordinated effort.